Don't miss this special offer! Flash this e-Voucher and enjoy Spicy Chicken Favourite Meal at RM10 only!!!! Valid from 5 till 7 April 2017 (3 days) T&Cs Apply. Kenny Rogers Roasters Spicy Chicken Favourite Meal at RM10 only! 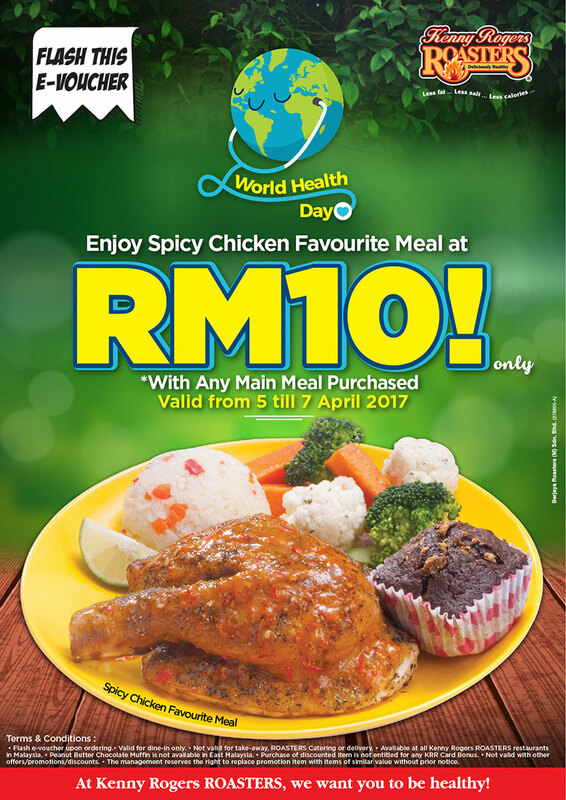 Flash this e-Voucher and enjoy Spicy Chicken Favourite Meal at RM10 only. Flash e-Voucher to enjoy the offer. Valid for dine-in only. Not available for take-away, ROASTERS Catering or Delivery. Purchase of discounted item is not entitled for any KRR Card Bonus. Available at all Kenny Rogers ROASTERS restaurants in Malaysia. Not valid with other discounts/offers/promotions. The management reserves the right to replace promotion item with item of similar value without prior notice.